Items touting chia seeds and flaxseeds are everywhere. What makes these little guys so special? People have eaten shia seeds and flaxseeds since ancient times. Chia seeds come from a desert plant that grows in the southwestern U.S. and Mexico. The Aztec people believed that eating the seeds provided an energy boost. Flaxseeds come from the herbaceous flax plant. They have been traced back to Babylonia and were believed to have medicinal properties. The seeds are both good sources of fiber, vitamins, minerals and heart-healthy polyunsaturated fat. Unlike flaxseeds, the body can absorb the nutrients from chia seeds whole. Flaxseed, however, cannot be fully digested whole. They must be ground so that the nutrients are available for your body to use. These seeds made a 21st century comeback because they provide alpha-linolenic acid (ALA), an omega-3 fatty acid. Omega-3 fatty acids are used to form cell membranes as well as signaling molecules, and they may reduce inflammation. Additionally, ALA cannot be made in the body. It comes from food. Other sources of ALA are plant foods like canola oil, black walnuts and soybean oil. The body requires two other types of omega-3s: EPA and DHA. EPA and DHA come from marine foods like fatty fish (tuna, salmon and mackerel), fish oil, krill oil and algae oil. Both plant and marine sources of omega-3s are beneficial. Choose omega-3s that align with your dietary preferences. 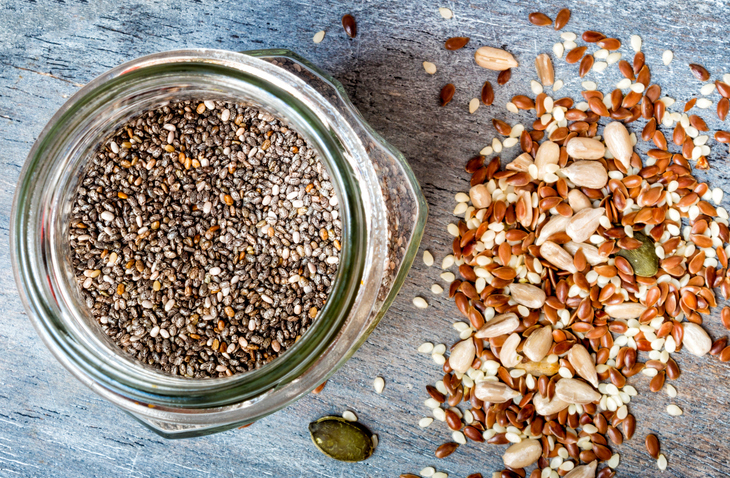 Flaxseeds and chia seeds could be an easy way to incorporate more plant-based omega-3s into your diet. Remember that these seeds provide essential fat and are higher in calories because of the fat (fat is 9 calories per gram). The recommended portion is no more than 2 tablespoons per day. Chia seeds and flaxseeds are available in many grocery stores. Chia seeds are typically sold whole, but flaxseeds can be purchased whole or ground. Whole seeds have a longer shelf life and should be stored in an airtight container at room temperature. You can easily grind them yourself with a coffee or spice grinder. If you would rather buy ground flaxseed, store it in the freezer to prevent spoilage. Because of their texture and flavor, chia seeds and ground flaxseeds are great additions to cereal, yogurt and smoothies, but you could add them to cooked dishes like a casserole or crockpot meal. They can also be used in baking. Chia seeds make a gel when mixed with water, which enables them to be used in baked goods to add moisture. Ground flaxseed can be used in place of a little bit of the flour in a baked goods recipe. There are some medical warnings about eating chia seeds and flaxseeds. Talk to your doctor if you are on a blood thinner or blood pressure medication because chia seeds and flaxseeds may interact with these drugs. Women who are pregnant or breastfeeding should not eat a large amount of flaxseeds. 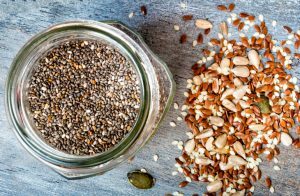 Finally, some people have reported an allergy to chia seeds, so take caution, especially if you are allergic to sesame or mustard seeds. Emily Selph is a graduate research assistant and dietetic intern with the Department of Foods and Nutrition at the University of Georgia. Harvard T.H. Chan School of Public Health. Version current 2017. Omega-3 Fatty Acids: An Essential Contribution. Internet: https://www.hsph.harvard.edu/nutritionsource/omega-3-fats/ (accessed 17 March 2017). National Institutes of Health – Office of Dietary Supplements. Omega-3 Fatty Acids Fact Sheet for Health Professionals. Version current 2 November 2016. Internet: https://ods.od.nih.gov/factsheets/Omega3FattyAcids-HealthProfessional/ (accessed 16 March 2017). WebMD. Why Are Chia Seeds Good for Me? Version current 2017. Internet: http://www.webmd.com/food-recipes/features/why-are-chia-seeds-good-for-me#2 (accessed 16 March 2017). WebMD. The Benefits of Flaxseed. Version current 2017. Internet: http://www.webmd.com/diet/features/benefits-of-flaxseed#1 (accessed 16 March 2017). Posted in Featured, Resources. This entry was tagged diet, healthy, holiday health, nutrition, recipe. Bookmark the permalink.